Swiss Balance Wheel Escapement. Spring Drive. Plays the Westminster melody on a five-rod gong. Movement: Kieninger AEL 04 - with chrome brackets that can be used on the front or rear plates..
Gongs: AEL 5-rod gong, 120mm base mounting. Please note that all metal dials are supplied fitted to a back plate with four pillars - these connect directly to the front plate of the movement ensuring accurate positioning. The AEL movement specifications. 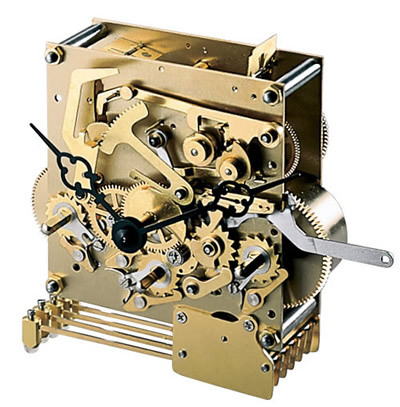 Plate size 100mm x 104mm x 1.7mm with six bronze bushes, a patented Kieniramic7 Dead Beat Graham escapement, an automatic tick (beat) adjustment mechanism, a chime control lever with three selectable positions, providing the choice of Automatic Night Silencing (between 10pm & 07-15AM), continuous chiming and silent. The AEL movement plays the Westminster melody, chimes the hours and strikes on the half hour on a 5-rod gong. 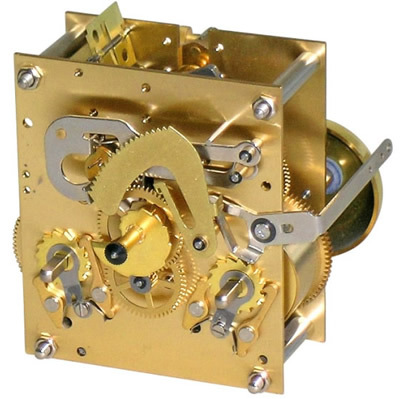 This movement set is suitable for a mantle or small wall clocks - it requires a minimum measurement of 102mm from the inside face of the dial glass to the inside of the rear panel. For your convenience we can supply the Dial, Hands and Movement assembled as a unit - the AEL 04 has two chrome plated brackets that can be front or rear mounted on the movement and these are used for attaching the movement to your clock cabinet. Click here to view the Set 01 Movement Dials and Pendulums images page. Click here to view the Set 01 Options and Prices page. 1/2 hour strike on a movement mounted brass Bell. Movement: Kieninger LEG 01 with a rear mounted polished brass bell. Gongs: Single rear mounted brass bell. The LEG 01 movement specifications. Plate size 100mm x 85mm x 1.7mm with 4 bronze bushes. 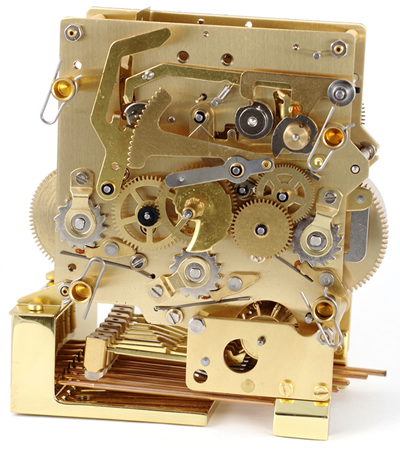 5-jewel Swiss Escapement, Chime silencing, front Winding through the Dial. The movement chimes the hours with a single chime on the half-hour on a single 50mm brass bell. This movement set is suitable for mantle or small wall clocks. It requires a minimum measurement of 108mm from the front of the hand-shaft to the inside of the rear panel. Click here to view the Set 02 Movement Dials and Pendulums images page. Click here to view the Set 02 Options and Prices page. Plays the Westminster, Whittington & St. Michael melodies on an 8-rod gong. Movement: Kieninger J 0221 Front winding, Highly Polished Version on legs. Gongs: Eight rod polished base mounted gong. The J 0221 movement specifications. 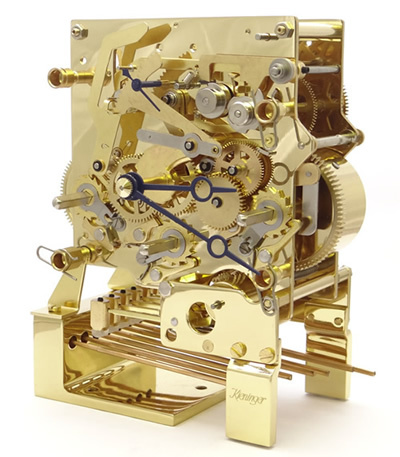 Plate size 100mm x 104mm x 2.0mm with six bronze bushes, a Swiss escapement, a chime control lever with three selectable positions, providing the choice of Automatic Night Silencing (between 10pm & 07-15AM), continuous chiming and silent. This movement winds through the dial but it is available to order with Rear winding. 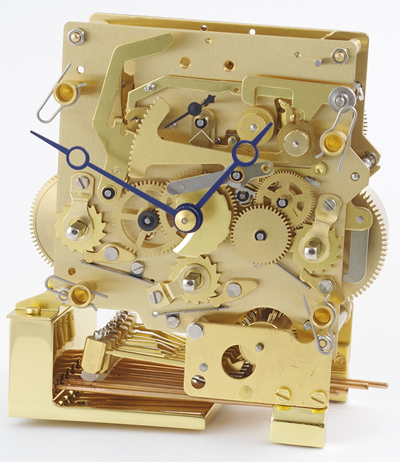 This movement is suitable for mantle or small wall clocks. It requires a minimum distance of 107mm from the front of the hand-shaft to the rear panel. When you place an order, we will provide a Kieninger drawing that gives all installation dimensions. Click here to view the Set 03FP Movement Dials and Pendulums images page. Click here to view the Set 03FP Options and Prices page. The J 0203 movement specifications. Plate size 100mm x 104mm x 2.0mm with six bronze bushes, a Swiss escapement, a chime control lever with three selectable positions, providing the choice of Automatic Night Silencing (between 10pm & 07-15AM), continuous chiming and silent. This movement winds through the dial. Click here to view the Set 03FS Movement Dials and Pendulums images page. Click here to view the Set 03FS Options and Prices page. Swiss Balance Wheel Escapement. Spring Drive..
Movement: Kieninger J 0208 rear winding on polished legs. Dial: Kieninger 122mm diameter White dial (including hands) with black Roman numerals, a subsidiary seconds dial and a brass rim. Gongs: Polished Brass Base mounting Gongs - High rods Use with Mounting 013/J. Kieninger J movement. The J 0212 movement specifications. Plate size 100mm x 104mm x 2.0mm with six bronze bushes, a Swiss escapement, a chime control lever with three selectable positions, providing the choice of Automatic Night Silencing (between 10pm & 07-15AM), continuous chiming and silent. This movement winds through the dial. This Special Base mounting version of the J movement is highly polished and it includes a polished 8-rod brass gong assembly and matching polished brass legs. It is suitable for mantle or small wall clocks. It requires a minimum distance of 107mm from the front of the hand-shaft to the rear panel. 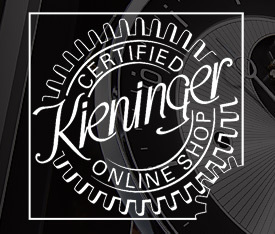 When you place an order, we will provide a Kieninger drawing that gives all installation dimensions. Click here to view the Set 03RP Movement Dials and Pendulums images page. Click here to view the Set 03RP Options and Prices page. Movement: Kieninger J 0203 rear winding on polished legs. The J 0244 movement specifications. 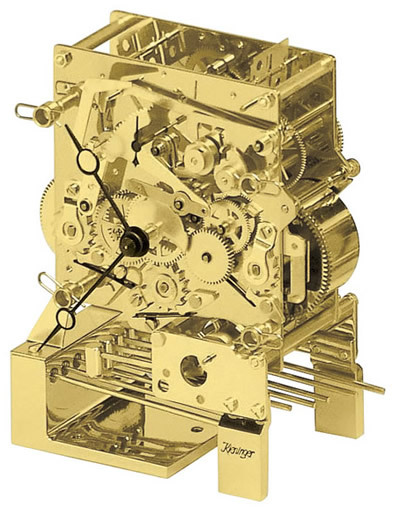 Plate size 100mm x 104mm x 2.0mm with six bronze bushes, a Swiss escapement, a chime control lever with three selectable positions, providing the choice of Automatic Night Silencing (between 10pm & 07-15AM), continuous chiming and silent. This movement winds at the rear. Click here to view the Set 03RS Movement Dials and Pendulums images page. Click here to view the Set 03RS Options and Prices page.